Once upon a time, Mobile Suit Gundam was big in the west and we were getting everything from the anime, to the model kits, to the video games. It was everywhere including your local Toys R Us. And then the PlayStation 3 launched with Mobile Suit Gundam Crossfire, a game where you chose to side with either the Earth Federation or the Principality of Zeon during the One Year War. You worked your way up to the end of war, climbing the ranks, gaining more pilots, and upgrading your mobile suits. Graphically, the game didn’t look too bad, but it was kind of muddy and sometimes lights didn’t work which made the optics on mobile suits look, well, blank. The framerate was also really choppy and the combat was 50/50. If you accidentally destroyed a supply depot in mission, if you played another mission on that map later on, it would still be destroyed and you’re screwed if you run out of ammunition or get too damaged. I barely finished a missing by kneeing the enemy units(Did I mention the AI isn’t that smart either?). Needless to say, the game was panned in the west, 5 or 6 out of 10 typically, but that apparently was enough for Bandai Namco to flip the North American Gundam fans the bird and tell us that we weren’t going to get anymore Gundam games, and they kept their word on that for a little over a decade. The only games we got during that time was the Gundam Musou games which were an exception of some kind. What sucked was that the next game after Crossfire, Battlefield Record 0081, was infinitely better. Fast forward to the present day and Gundam Versus, which released last year, was received well, but apparently didn’t sell as well as Bamco would have liked around the world. This resulted in the DLC plans being cut short, stopping after February of this year and leaving the games roster with decently sized gaps. 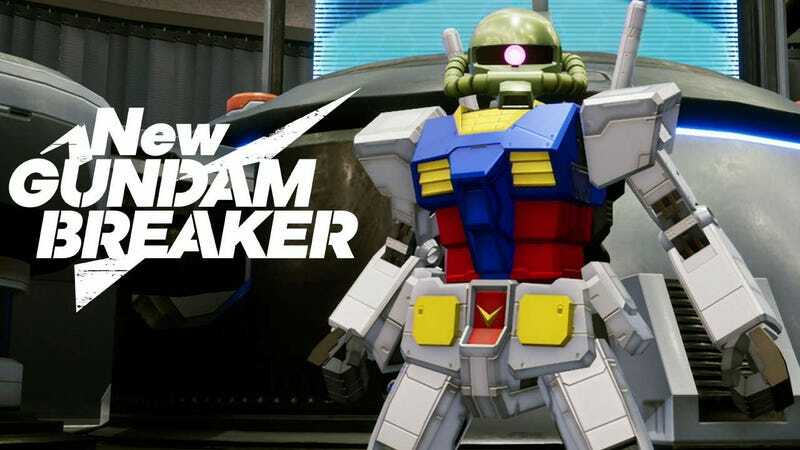 The next release on the list was New Gundam Breaker, a reinvention of the Gundam Breaker series where you collect pieces to built your own custom mobile suit and take it into battle with Dynasty Warrior’s-esque gameplay. And for the first time, the game would be receiving a worldwide launch. Sounds great right? Well, apparently Bamco didn’t know what it was doing because according to reviews on both sides of the Pacific, New Gundam Breaker is a steaming turd with the average review score more or less sitting around a 2 out of 5. There are so many negative reviews that no amount of good reviews can balance the scales, and Amazon has apparently stopped taking reviews on their Japanese storefront. It’s probably not hard to guess that New Gundam Breaker will not sell well. I bought the game, unaware of how bad it was going to be, but apparently the beta, which only ran just this past week prior to release, was already indicating how bad it was going to be and I never picked up on it. So now my copy is on its way back to Amazon for a refund, unopened. Now, what I wanted to address, is a fear I’ve seen coming from some people in comments sections across the internet. The general fear is that since New Gundam Breaker has been received even WORSE than Gundam Crossfire was in the US, that it will lead to what I’ve dubbed the Second Gundam Game Apocalypse(SGGA for short. ), where Bamco will decide that the US will no longer receive Gundam games... again. Except there’s a difference this time: The Japanese gaming community hate it just as much as we do, which means that New Gundam Breaker is a failure in general and they can’t pin it on the US fanbase or the worldwide launch. They brought in a new dev team and canned the old one, switched engines because it was cheaper, and shipped a broken product that they KNEW was busted and just plain bad. But they released it anyway and had the beta the same week as release so that they could get your money and you wouldn’t suspect a thing. Going forward, there is only one console Gundam title on the horizon(Gundam Extreme Vs. 2 is heading to arcades once more.) and that’s the free to play Gundam: Battle Operation 2 for PlayStation 4. The previous Battle Operation games were not bad, they were actually at least somewhat enjoyable, but they were also pay to win. Supposedly that’s being curbed for this installment, but it remains to be seen if they’re new approach won’t end up the same way. Having said that, Battle Operation 2 is not currently slated for a western release and doesn’t even have a set in stone release date outside of “2018" and something tells me that won’t hold up.